If you'd like to leave a message please do get in touch by using the "Contact Maizie" button on any page of this site. I'd particularly love to hear from anyone who has photos or memories of our shows from the early days, but of course any message is most welcome. From time to time we'll be updating this page with the best of your messages - so don't hold back! Great to read on Facebook that there will be a new single - and a video shoot as well!! Can't wait to hear it. I have all the Boney M recordings - and of course your solo recordings as well! I've been a huge Boney M fan for ages. Your fan, Michael Mell (London). Yes the single will be on its way soon. All the details will be on the news page but I'm not giving away any secrets by telling you there will be a limited edition CD version as well as the download for those who get to my store page first! I think you're going to like it! All my best wishes for you and the video - and the new single Maizie! Let me know what you think when it comes out. Long ago, when I was a young boy, I was often dancing to your great music while trying to bewitch one girl or another. Your music has brought about this miracle! For the great 70s and your great music I want to say a loud THANK YOU. Boney M songs will remain immortal. I still love dancing now. - Both dancing & boxing (similar!) are part of my daily routine, which you'll be able to read about when my new Natural Health & Beauty book comes out. It's taken me a long time to write it because I've been so busy but I'll keep everyone updated about its progress on my news page. Looking forward to the release of your new single, such a lovely idea to make a tribute to Bobby! Hope everything is well and God Bless. Bobby was such a very dear friend and he lived for dancing so I hope you agree this song is the perfect tribute. Cool to see the photos from your new video shoot - can't wait for it to be out. I will be dancing to it for sure! I challenge anyone not to be dancing to this one! Send me a video of you and your friends dancing to 'Josephine Baker' when it comes out this October and I'll find an area to post it on my website. Best of luck with your new single and hope to see you in a show in Paris soon! Paris has always been one of my favourite places to perform so I hope to be back there again soon. Thank you for taking the trouble to write. When are you coming to Stockholm, Sweden?? Great to hear about your new single. We all miss Bobby Farrell very much and hope that you will stay healthy and happy! I'll be doing my best to stay healthy and as long as I'm performing I'm always happy. I know I say this about so many cities but Stockholm is really a beautiful city full of beautiful people so I feel sure it will be back on my busy tour schedule again soon. Just try and keep me away from you there! Yes, I'm missing Bobby but it's been fun putting together this new single and thinking about him. It's a genuine tribute and I hope everyone there in Stockholm will like it. We are having a really great Boney M evening - brothers and sisters meeting up for a get together - loving the music - we decided to Google 'Boney M' and happy to be able to email you and say 'Thank you so much for the music' the vocals are amazing - we have just got to be your biggest fans. In party mood we always did a great Boney M - we wish! Ha ha! We love the music so much we feel we get right into it every time - just glad there's no audience! You have given us so many happy memories. 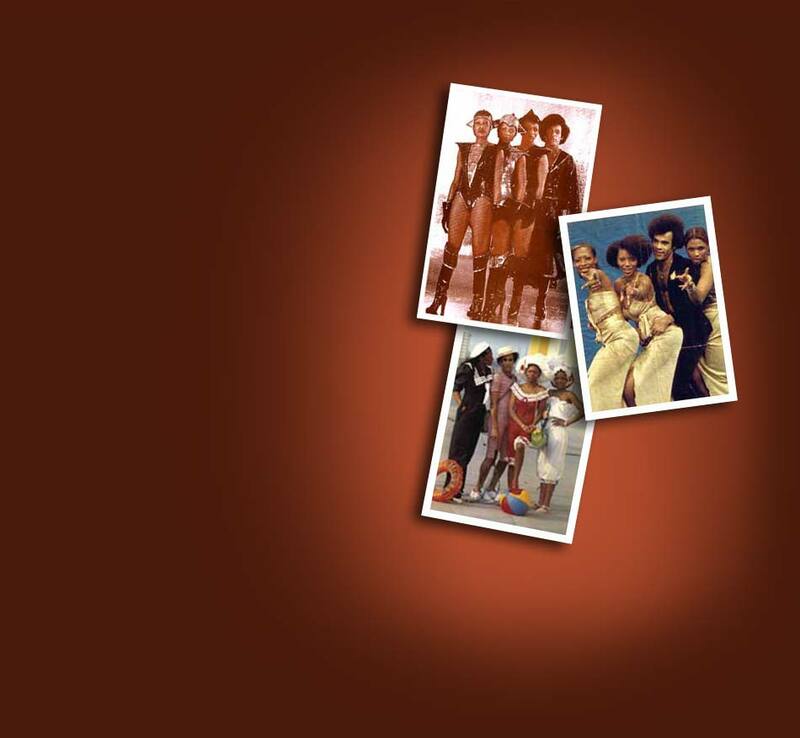 Last Saturday all the Boney M greats were on a music channel called 'Saturday Night At The Disco' - brilliant. Tonight we have your CD on and are totally enjoying the music. We hope you are well and having a great life - you certainly enriched ours with your lovely voice so thanks for everything and we wish you all the best - thank you Maizie Williams. Thank you so much for your email. It always makes me happy to read such kind words and great to hear that you still enjoy the Boney M songs. I am very well at the moment; we are doing a lot of shows in the UK, as well as abroad, which keeps me very busy! Hi I am a Sri Lankan and when I was a kid in 1979 my uncle who worked in the UK bought me a record player and a Boney M. Ever since I've loved your group and songs! When u came to Sri Lanka for a show I took my wife and my son to see you but unfortunately Bobby wasn't there with you. Keep up the good work and god bless you for coming up with so many good things that keep our life going. All the best and I love u all. Thank you for your email. Since the four members split up many years ago we haven't performed together. Bobby still does shows occasionally but I am not quite sure how much he's on the road these days. We are all performing and perpetuating the hits of Boney M which for sure are still loved by very many people around the world. I'm looking forward to coming to Sri Lanka again as it is such a beautiful place! I am one of your great fans from India. I am listening to your music from 1983. Nowadays a lot of music troopers are out there. But I still greatly love your music. The only sad thing for me is that you have split up. You changed the path of music at that time and started a new era in world music. Yes, it is sad when groups spilt up, but sometimes it's for the best. When there are more fights and arguments than good times it's plainly time to go separate ways. And sometimes people just grow apart. But you're right – the 70s and 80s were a special era which brought about songs that still are being played on the radio today and I feel blessed that I am a part of it! Been enjoying watching the videos on YouTube and have downloaded 7 of Boney M's best songs from iTunes and look forward to playing them in my radio show! I've been saying to people recently that the late 70s and early 80s period was a time when people could actually sing and play instruments!!! There were some beautiful harmonies back then, as listening to Boney M's hits proves, along with others from that era! Everything in this world seems to be somewhat circular and although I enjoy trance music I believe we will see an increased return to playing instruments properly and singing too - and that's definitely a good thing as it will bring your high standards back to the mainstream music industry!! It's surprising you know - how many teenagers actually enjoy the grooves from the late 70s and early 80s, subconsciously showing that there is a need for real singers and musicians!! Good to hear that you enjoy our videos and music – iTunes /YouTube are great for that! I had an amazing time touring in the 70s and 80s and, as you say, it was a truly magical time. Music from those days just seems to live on longer than some created more recently and it's hard to say why. I guess that's why so many people, both young and old, still love our music! Thanks for your email and keep an eye open for news and updates on this website! I was in London for my cousin's wedding on July 13, 2008 in the Berkeley Hotel. The guests were really surprised when they announced Boney M would perform for the bride and groom - WHAT a fabulous evening! I've not danced so much since I was a youngster. I really LOVE you guys. Thanks for all the amazing years of enjoyment. Thank you for your email and nice to hear that you had a splendid time at your cousin's wedding. Weddings are always a bit special to perform at – you want everything to be perfect and nothing should go wrong - I'm sure you agree! But it sounds like you had a great evening and hope the bride and groom had a wonderful day too. I'm very pleased to have found your website. I was really surprised...it's like Boney M is still going!!! It was really a good time, listening to your songs when I was a teenager. But this music never dies!!! I am just wondering if there is a DVD with all of the clips of Boney M? It would be nice to have it in my collection. So I wish you all the best and I'll never forget you!! You will be in my memories all my life. Greetings from Fabian in Belgium. Thank you for your kind email! The website was a lot of work to get together but was definitely worth it! Because nearly everyone in the world uses the internet now it became unthinkable not to have my own site... there's a whole new generation now listening to our music and coming to my gigs. And you'd be surprised just how many thousands of people visit this site every day. Boney M is very much still alive and kicking. Although the original band don’t perform together any more you can still enjoy our music when I’m out on tour. The best way of getting clips of the group would be to search further on YouTube, and of course Amazon and eBay always have a variety of CDs and DVDs available. Best of luck! My name is Radka Hubatová. I am a six-year-old girl and live in Prague, the heart of Central Europe, in the Czech Republic. I am now starting my first class at elementary school. I like listening to songs by Boney M. and my favourites are Rasputin, Ma Baker, Love for Sale and Belfast. You are my most favourite singer and Boney M is my favourite music group. My dad helped me with this email for you. I hope next time I can write to you without his help. Thank you for your lovely email; you are doing great with the writing! I think you must be my youngest fan and it thrills me to hear that you like our music. I'm looking forward to receiving another email from you and keep up the good work in school! I am from Austria and I am a very great fan of yours! I found this address on the internet and now I hope to be able to get a signature on a picture from you, please! What are you doing now? What is your next project? Is it possible to meet you some day??? Please give me an answer! Thank you for your email. You can get a signed photo through the website HERE. I'm sorry you have to pay for it but with the huge number of requests from all over the world this was the best way to set things up. Otherwise I am busy working as usual and as we are coming closer to December and Christmas there are a lot of shows to do which I am grateful for! I am sure that you will be able to see me in Austria sometime soon! Thank you for the wonderful time in music history with Boney M. I am 47 years of age and still playing your records. But now I have a PC at home so I saw your site for the first time. I hope everything is OK with you. Greetings from Arie, and all the best in the future. Thank you for your lovely email. Great to hear that you like my music and, yes thank you, everything is fine with me. I'm busy working as usual! You’re the best! I like that so much because you remain always forever young in my restless heart. 'Rivers of Babylon' is my favourite hit. Many thanks! Thank you for your kind words, and don’t forget to check out the website here for news updates! I am one of the many people who love Boney M songs. But as I am already 61-yrs old I am not aware of much pop music. I am from Myanmar (formerly Burma) closed to the west side of Thailand. Anyway - I am happy to get in touch with the Boney M team. I wish you a colourful day. Thank you for your kind words and I wish you all the best in the future. I'm sorry my English is a little bad but I'll try to tell you what I think. I was looking for pictures of Boney M, because my boyfriend loves this group, and so I found your website. I'm very happy! to my love. So then he will be happy too! I would like to tell you how I am surprised and happy to see the songs I used to listen to when I was a child. My father didn't have TV at home, so I can only hear them on the radio. After that, I saw you on TV shows. I feel good when I read the message of love and spiritual power. It gives me hope and I feel better. I hope I will read some more news about you very soon. Thank you for your lovely email and it is great to hear that my feelings about spiritual love give you strength to carry on in life! I'm from Timisoara, Romania, and I have been yesterday to the "Club 30" 10 years anniversary. You made a big show; it was something special for me and my wife to be there and listen and dance to your music and seeing your great performance. Keep it up and "Let it be". Thank you for your email and great to hear that both of you enjoyed yourselves! It is always a pleasure to perform and to feel the love and appreciation from the audience. I just got home from my disco weekend at Butlins in Minehead. I wanted to say a huge thank you for such a wonderful show. The music brought back fond memories of my younger days. You and your group are wonderful performers and watching you was one of the highlights of the weekend. Thank you for your kind words! And thank you for coming to support me - it's such a great feeling to get good feedback from the shows we do. A large compliment for you! Your new 'Daddy Cool' video with Melo-M is simply magnificent! And you look simply magnificent too! I would be very, very happy if you would get into the charts! Glad that you like my new single. I'm very fond of it myself and the guys in Melo-M are really sweet - we all keep our fingers crossed regarding the chart! Tell all your friends to download it HERE and then... who knows what might happen?! We recently saw you and your group perform at Pontins in Prestatyn, North Wales and just wanted to say thanks - what was a holiday mainly for the children turned into a fantastic evening for us as well. Even though you only performed for an hour we really did enjoy it and the children haven't stopped singing 'Daddy Cool' since. My son, who is mixed african/white, was thrilled when you touched his head and sang 'Brown Boy In The Ring' too! Ziggy, Cathy, Billy and Barney. Thank you for email. It's always a pleasure to visit Wales. Great to hear that your children likes the songs, and of course that you both also enjoyed yourselves! Congratulations to you. Your recordings are very well done. Today I've seen your Melo-M video with Daddy Cool; it is marvellous! But where can the Fans buy this Masterpiece? All the best to you and One Love. Your can get hold of the song via download on iTunes HERE and the video will also be shown here on this site. Take care and best of luck with everything. I hope that you are well and very busy with all your projects! Can you tell me when the new recordings are going to be released? Like a lot of fans I can hardly wait for the new singles and album, etc. Will they be out soon? Good news! Both my album and Christmas single have now been released. You can find details on the STORE page of my site where you'll be able to buy hard copies or get downloads from Dec. 11th. I was blown away by your website; you are such an inspiration. I can’t wait to get hold of your new Gospel CD. The short clips sounds wonderful. I also like the look of your health book, and will be looking out for anything else that you have coming out. You always look great. God be with you and I wish you all the very best in everything that you do. Thank you for your kind words and it's great to hear that you like my music. Remember that the website here will always be the first place for news about anything of mine being released. My name is Piotr Haase. I am 31 years old. I live in a little village in Poland, together with my wife Kate and two sons Albert and Adrian. I have been your fan since many years. I really admire you and I think you are very good in what you do. I was wondering if you could send me your autograph? I would be very grateful. Thank you in advance. A signed photo is on its way to you now! First, I would like to tell you how much of a big fan I am of your work! I am e-mailing you to tell you how much of a great singer I think you are. You really are a huge benefit to the music profession, an exceedingly talented singer, and a living legend. It is always a delight to listen to many of your songs with Boney M. I was wondering, if possible, you would be able to please send me a personalized, autographed picture? If so, thank you! Of course I will send you a signed photo! Your site is fantastic! I was a great fan of you and Boney M since the beginning. I have all the singles and albums and all the fan club magazines. From the beginning I was a member of the Dutch Boney M fan club in Holland organized by Ria Westerbeeke and Aad Goud from Rotterdam. Maybe you remember?? Now I’m 42 years old, but I love the music again and again. It’s timeless. Boney M was my favourite group in my school time. By Google I found your site…… and so I go back in time to see all the pictures. Maizie - good luck with all your plans. I hope that maybe there will come a photo of the original group: Liz, Marcia, Maizie and Bobby anno 2006/2007. Then I'll have a special memory of the group now that I'm grown up! Great to hear that you are still such a big fan of Boney M. Unfortunately I don’t remember that specific fan club as there are and were quite a few around! Thank you for still staying with us! What a great site. I've been in touch with you and Boney M since I was a young boy. I have all the albums and some live shows with you and the group. When will your new single come out?? I hope soon. You were a great member of Boney M together with Liz, Marcia and Bobby. Thank you for you email - the final mix of my new single will be available before the end of 2006. Watch this site for details! I grew up listening to Boney M's music and am a very diehard fan of Boney M.
I'm really happy to see you finally having your own website. I've heard the samples of your new songs and they're great. I've always had a wish of collecting Boney M's singles but haven't found them on cd. Just wondering if you have any idea whether there will be any release of all Boney M's singles on cd in the near future? Thank you for your kind words! I know you can get hold of most singles from Amazon (see individual links HERE), but you could also try iTunes and eBay as they both have a huge range of music. I got your e-mail through 'Boney M' search. Boney M was great music and 'Daddy Cool' is being played at every wedding in Canada. 'Rasputin' is superb! Glad to see you are still in the music; your intro song is superb! Great to hear that you like my song! The final mix will be downloadable from our friends at iTunes very soon. Site nice may jah smile pon u an bring u many happy days! I’m a huge fan of Boney M. since 1978. Unfortunately I was too young to see the "original" formation live. I was lucky to see and meet Liz and her formation a few times already. I also saw Bobby once. I really hope to see you also one day!! It’s a great hope of mine, to get your autograph, and maybe to get a photo with you! Please let me know. If you email me your address, I will send you a signed autograph card. Great to hear from someone from my own home country! If you email me the song I will do my very best to listen to it and give you my comments. What a great website! I have recently been to see the Daddy Cool musical at the Shaftsbury Theatre and I thought it was fantastic! It was full of energy and the cast were great. Have you had a chance to see it yourself? Good Luck with everything and I am really looking forward to you new album. Great to hear that you liked the musical and no – I haven’t had a chance yet because of my very busy schedule. But as soon as I have some time off I will go and see it! Just bought the brand new Boney M book by Didi Zill and all of the photos are great! And it is very interesting reading about all of the photo shoots! I will also buy one for my mother for Christmas. The book brings back a great many fabulous memories for me and I'm glad you like it. They sure don't make costumes like that any more! I have been so lucky to see you live in Dubai, New Year's Eve 2000 in the Irish village. I moved to London now and live here, please let me know how to see you live in concert in U.K.
All the best and support for the first and original member of my sensational love Boney M. I support you in all your endeavours and consider you to be one of the most important members of Boney M.
I love Dubai, it is a beautiful place and I had such a great time there last time! My name is Sascha, and I’m a great fan from the beginning of Boney M.
really good and I will buy your single and album as soon as possible. to hear your songs. When will your album be released? To help the poor people in the world. Thank you for this. Great to hear that you enjoy my website! I try to reach out to those people who are less fortunate than us. One person cannot do everything, but many can do a whole lot! Who was or were the speaker vocals in Ma Baker, Rasputin and Bahama Mama??? It has been so long since those songs were recorded that I actually can’t recall who it was. My apologies but thank you for your email. Hi Maizie. Must congratulate you for your magnificent website, you look beautiful. I hope to get the opportunity to meet you one day. That would be a dream come true. I am a Boney M. fan since I was a child. Congratulations for your new CD, which I hope to get. I wish you the best and send you a big kiss from Spain. Thank you for your email and good to hear that you like my site! My new single will be available in full for download in the near future.